During 2003-4 a scoping study was carried out for a possible project to assess the prehistoric defended settlements of Wales, including hill-forts and other kinds of defended settlements such as ring-works and inland and coastal promontory forts. These form a key part of the prehistoric landscape, both visibly and as a focus of the past social and political structure. Many are also highly visible in the present landscape and are important as for visitors and as an educational resource in Wales where the Celtic heritage is part of the curriculum. The project provided a review of previous studies of defended settlements in Wales, study of research agenda and consultation with individuals in the WATs and other related organisations in Wales such as the three national parks and the Denbighshire County Council Heather and Hillforts Project. Useful discussion was also held with the Ian Hedley of the Northumberland National Park Hillfort Heritage Project and Al Oswald of English Heritage who is carrying out detailed surveys as part of the same project. The work included study of the existing WAT and RCAHMW records of defended settlements and the site types used and comparison with those used in the English Heritage Site Type Thesaurus and by the English Heritage Monuments Protection Programme. The report summarised the number of monuments that would need to be visited across the whole of Wales and showed how many of these were protected as Scheduled Ancient Monuments. It suggested a design for such a survey and produced suggested draft definitions for monument evaluation criteria. It also produced accompanying draft field recording forms and carried out case studies of two sites as examples. One was a large and relatively well studied Scheduled Ancient Monument, Castell Caer Seion, Conwy. The other was smaller, unprotected and unstudied hillfort, Dinas Ty-Du, Llanberis. This allowed testing of the proposed field recording and monument evaluation in quite different situations. It showed that there is a great deal to be recorded in terms of threats to and condition of monuments, as well as understanding of the monuments themselves and of their surrounding landscape. The study as a whole demonstrated the potential for a survey of prehistoric defended settlements. It showed that more than half of all known defended settlements in Wales do not have statutory protection while those that are protected are mainly the largest and most visible examples. Many of the remainder are smaller and not visibly impressive or even exist only as subsoil features recognised as crop marks but they may be equally valuable for research, often for a different range of periods or social structure than the hillforts themselves. Research excavation of defended settlements has been rare in recent years and understanding of the first millennium BC has made little progress. In much of Wales, lack of artefacts, particularly ceramics, for settlements of this period makes excavation often unproductive and unattractive despite the need for it. Several excavated hillforts show origins in the Late Bronze Age as undefended hilltop sites or lightly defended palisaded enclosures. Such features may exist at other hillfort sites, masked by later features. Similar early enclosures have also been identified in the lowlands and more are likely to be identified, some amongst the body of aerial photographic information that already exists, some by new photography. Geophysics provides further potential for the identification of early defensive features within known hillforts and patterns of settlement within defended sites generally, including those at present known only as crop marks. 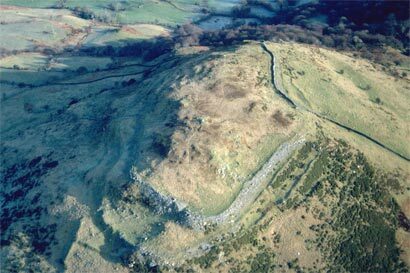 The IFA Research Agenda for Wales in its section on the Iron Age by Adam Gwilt highlighted the fact that although excavation of the Iron Age period in Wales has tended to focus on hillforts, very few hillfort interiors have been excavated and published. The relationship between hillforts and open settlement is still largely unknown. It pointed out that Welsh hillforts need to be reassessed in the light of fresh ideas about their function generally, which has now changed from the Wessex type ‘central place’ theory that predominated at the time that Hogg produced his syntheses. The observable regional diversity of hillfort types in Wales is significant and might be made more of in interpretation. The general scarcity of chronological and artefactual evidence for the first millennium BC was also noted. With regard to artefactual data it was suggested that although sparse there was a need for a proper Pan-Wales database. With regard to chronological data it was observed that survey alone cannot produce answers even though it can demonstrate the presence of multiple phases. Excavation is seen as urgently needed and a suitable start would be to reassess old excavations and their artefacts. While such is an ideal for research, which can be followed up by academic projects there is general agreement that there is a need for a re-assessment of and new initiatives for defended settlement. At the same time there is the realisation that collection of data alone is not productive without accompanying interpretation, synthesis and primary archaeological evidence. This view could apply to a general assessment of defended settlement unless it was carried out with specific research aims in view. The need for such a project was agreed and a meeting was planned to be held in Welshpool in April 2004 to identify options for such an assessment and to discuss the objectives and methods of the survey.